The Briefcase – loudlatinlaughing – Euge! Euge! 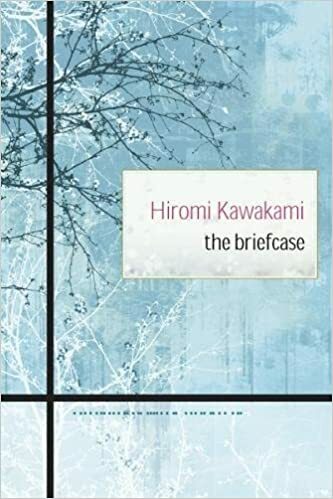 Hiromi Kawakami’s book (translated from the Japanese by Allison Powell) was a quiet, wonderful surprise. Her prose envelops the soft, budding relationship between a thirty-something woman and a teacher she had in high school. They connect years later by randomly frequenting the same after work bar and strike up a friendship that becomes central to Tsukiko’s life (she calls him Sensei because she doesn’t remember his name, but continues to call him that as a term of endearment). Their drinking buddy relationship gradually morphs into something more, Tsukiko declaring her love for Sensei in drunken bursts and he politely ignoring her until they finally begin to date. Mushroom hunting, ferrying to the island where his wife is buried, cherry blossom festival, but mostly they sit side by side at the bar, downing infinite bottles of sake. Very tender and precious, in the best way.